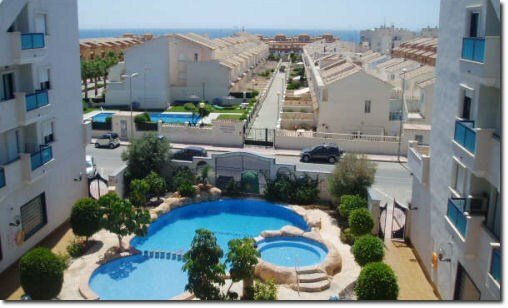 Apartment belongs to the complex aparthotel “ Playamarina I “ just 5 min walking to Cabo Roig beach. Complex disposes of communal swimming pool, jacuzzi and small visitors can enjoy child’s pool with warm water. Not far away from the complex, there is a small playground with swings and slides. Just downstairs you will easily find fine variety of shops, restaurants, bars,night clubs medical center and pharmacies. Most of them centered around well know Cabo Roig “strip” where there is plenty of choice for all ages and tastes. For those who get bored with just sitting in the sun, there are a lot of other activities to enjoy in and around Cabo Roig. Big shopping center Zenia Boulevard is situated in 2 km from the apartment. Supermarkets : Lidl, Aldi, Mercadona or Consum are at your disposal.The Saturday martekt in Playa Flamenca is very popular with the tourists or maybe a massive Friday market in Torrevieja is just what you needed. Do not forget to visit Aqua spash park ( Aquopolis) in Torrevieja, have an evening walk along the wonderful Promenade with its huge array restaurants and ice –creams parlous, the craft market, the fun fair and a new Habaneras shopping center.